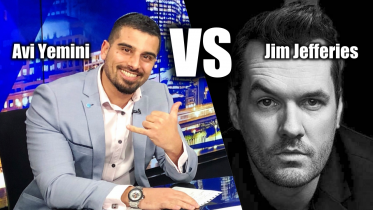 In Melbourne this week, we once again witnessed growing tensions between groups. Both are growing in popularity, and one is growing in anger, intimidation and violence. The media love to highlight the stereotypical mad-dog, right-wing, “neo Nazi”-looking crew, but they’re not the real problem. The real problem is the so-called “anti-fascists” who claim to be standing against hate (ironically in a very hateful way). What’s concerning is the escalating intimidation tactics, violence and intolerance being shown by these groups that are trying to convince us that they’re protesting against hate. These left wing groups are coming to protests with their faces covered and looking for trouble. Our police either don’t have the power or will to end their ridiculous and hypocritical reign of hate on our city streets. The most disturbing part is the fact that there are two groups in this world that use a similar symbolic tactic at their “protests”: the burning of flags. Those groups are Islamists and “peace activists”. As a military man I find the act of burning a flag one of the most disgraceful. The flag, to us, to all military men, is not just the burning of “a piece of fabric”, as many people like to minimise. The flag, to us, is what we put our lives on the line for. The flag represents our nation and our people. When a soldier heads into combat, the flag is in his eyes, heart and head. He is willing to die for it. These left-wing “peace activists” and “anti-hate” protesters act like our flag is some sort of bogan symbol. They have total disrespect for our country and the people who have risked everything for it. We’ve become used to seeing hateful Islamists around the world setting American, British, Australian and Israeli flags alight while they dance around, screaming hateful rhymes calling for our destruction. But now we’re seeing it here, in our own home and our own backyard. 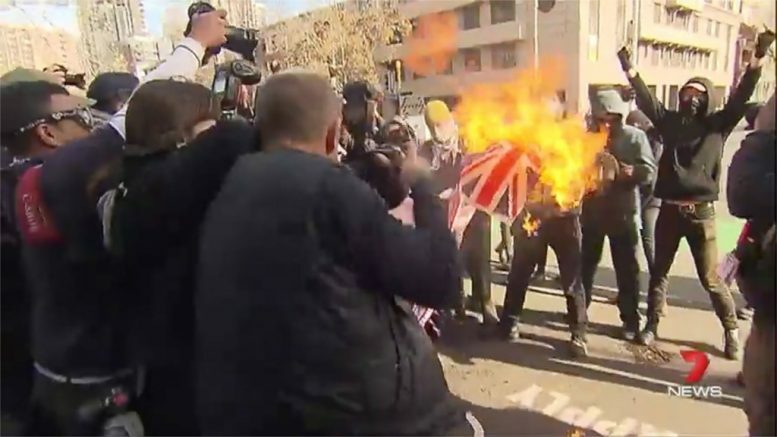 These “anti-hate” protesters are taking part in one of the most hateful acts: the burning of the Australian flag on our streets. The same flag that so many Australians have bled for. The flag that so many Australians will continue to bleed for. It’s simply unacceptable. I am all for “freedom of speech” and the “right to protest”, but we need to create some boundaries. We need legislation that protects those who protect us. The time has come to stop protecting those who hate us and what we stand for. We need laws that end violent protests. We need laws that end the cowardice in these protests, where these thugs who pretend to stand against hate get to cover up and hide their identities from the world. Finally, we need laws to make it absolutely illegal to burn our flag. No excuses. Australia: Ready to be defenceless victims again?